The ESA (European Space Agency) and NASA mission SOHO — short for Solar and Heliospheric Observatory — got a visit from an old friend this week when comet 96P entered its field of view on Oct. 25, 2017. The comet entered the lower right corner of SOHO’s view, and skirted up and around the right edge before leaving on Oct. 30. SOHO also spotted comet 96P in 1996, 2002, 2007 and 2012, making it the spacecraft’s most frequent cometary visitor. At the same time, comet 96P passed through a second NASA mission’s view: STEREO — short for Solar and Terrestrial Relations Observatory — also watched the comet between Oct. 26-28, from the opposite side of Earth’s orbit. It is extremely rare for comets to be seen simultaneously from two different locations in space, and these are the most comprehensive parallel observations of comet 96P yet. Scientists are eager to use these combined observations to learn more about the comet’s composition, as well as its interaction with the solar wind, the constant flow of charged particles from the Sun. 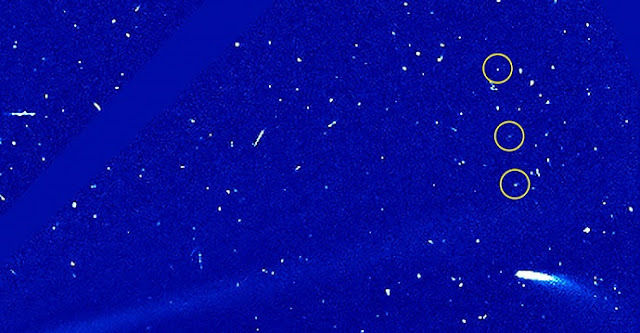 Both missions gathered polarization measurements of the comet; these are measurements of sunlight in which all the light waves become oriented the same way after passing through a medium — in this case, particles in the tail of the comet. By pooling the polarization data together, scientists can extract details on the particles that the light passed through. “Polarization is a strong function of the viewing geometry, and getting multiple measurements at the same time could potentially give useful information about the composition and size distribution of the tail particles,” said William Thompson, STEREO chief observer at NASA’s Goddard Space Flight Center in Greenbelt, Maryland. Comet 96P — also known as comet Machholz, for amateur astronomer Dan Machholz’s 1986 discovery of the comet — completes an orbit around the Sun every 5.24 years. It makes its closest approach to the Sun at a toasty 11 million miles — a very close distance for a comet. When comet 96P appeared in SOHO’s view in 2012, amateur astronomers studying the SOHO data discovered two tiny comet fragments some distance ahead of the main body, signaling the comet was actively changing. This time around they have detected a third fragment — another breadcrumb in the trail that indicates the comet is still evolving. Scientists find comet 96P interesting because it has an unusual composition and is the parent of a large, diverse family, referring to a group of comets sharing a common orbit and originating from a much larger parent comet that over millennia, broke up into smaller fragments. Comet 96P is the parent of two separate comet groups, both of which were discovered by citizen scientists studying SOHO data, as well as a number of Earth-crossing meteor streams. By studying the comet’s ongoing evolution, scientists can learn more about the nature and origins of this complex family.